We have set up and maintained a huge infrastructural facility for manufacturing the offered industrial boilers in compliance with the industry laid norms and regulations. With the aid of the large production capacity of our ultra-modern infrastructure, we have been able to meet the bulk demands in the most efficient manner. For the purpose of managing different units, we have appointed a team of skilled engineers and support staff support. These professionals are trained at regular intervals of time, to upgrade their skills as per our organizational goals and standards. Mr. Chintan Parmar and Mr. Abhishek Jethalia are directors of the organization and they have helped us in catering to the precise needs of our esteemed clients. Excellent management skills and innovative business polices of our directors has helped us in attaining a huge clientele across the nation. 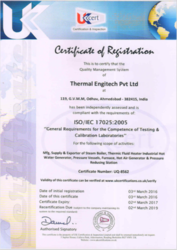 Manufacturing and Trading of Thermal Steam Boiler, Combi Design Biomass Boiler, Horizontal Thermic Fluid Heater, Vertical Thermic Fluid Heater, Hot Water Generator, etc. Our team of experts is appointed by our management after conducting different selection procedures based on their skills, experience and knowledge. By working in close coordination with each other, our professionals ensure a hassle-free working environment. Boasting of that, we work to attain maximum customer approval. Well-equipped with latest cutting, welding & lathe machines and hydraulic presses, our infrastructure is known for its large and streamlined manner. To ensure smooth operations, our infrastructure is carefully divided into different units. For managing different units, we have appointed a team of machine operators. High-tech infrastructure and dynamic workforce has helped us to offer our clients with the high quality industrial boilers at cost effective prices. 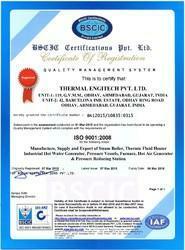 Excellent track record and ethical business practices have helped us in winning the trust of our esteemed clients. ISO / IEC 17025:2005 for 'GENERAL REQUIREMENTS FOR THE COMPETENCE OF TESTING & CALIBRATION LABORATORIES"